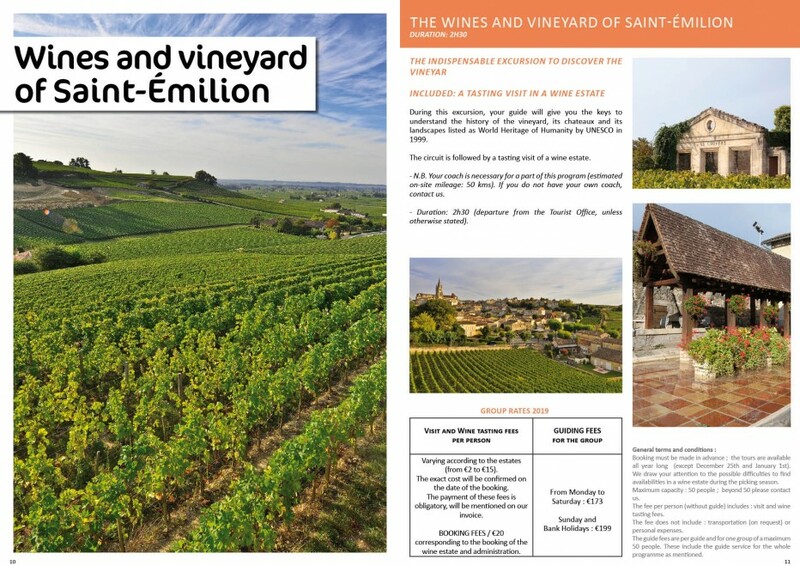 During this excursion, your guide will give you the keys to understand the history of the vineyard, its chateaux and its landscapes listed as World Heritage of Humanity by UNESCO in 1999. The circuit is followed by a tasting visit of a wine estate. N.B. Your coach is necessary for a part of this program (estimated on-site mileage: 50 kms). If you do not have your own coach, contact us. Duration: 2h30 (departure from the Tourist Office, unless otherwise stated). Varying according to the estates (from €2 to €15). The exact cost will be confirmed on the date of the booking. The payment of these fees is obligatory, will be mentioned on our invoice. corresponding to the booking of the wine estate and administration. Booking must be made in advance ; the tours are available all year long (except December 25th and January 1st). We draw your attention to the possible difficulties to find availabilities in a wine estate during the picking season. Maximum capacity : 50 people ; beyond 50 please contact us. The fee per person (without guide) includes : visit and wine tasting fees. The guide fees are per guide and for one group of a maximum 50 people. These include the guide service for the whole programme as mentioned.